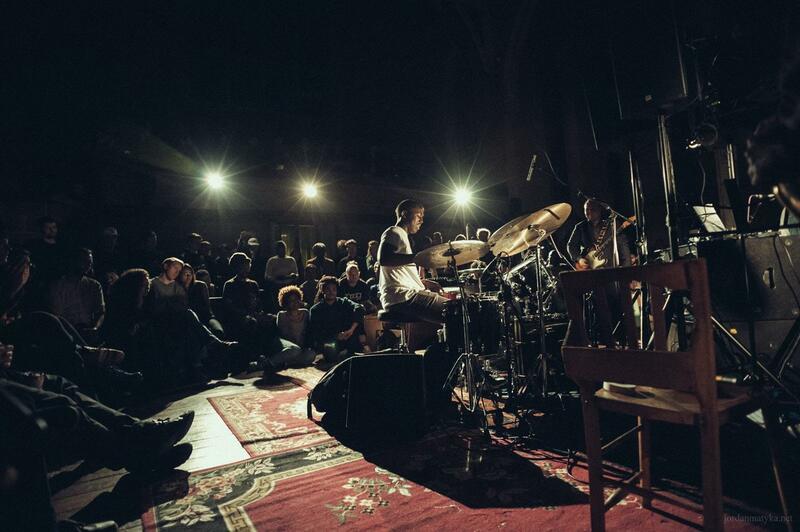 It’s no secret that jazz in London is in a good place right now. There’s a lot of talk about a resurgence, a renewal of energies, and while there’s something too that it perhaps devalues what’s come before, and doesn’t quite appreciate what might happen next. The direct communication between jazz and UK club culture – in particular that of Afro-Caribbean communities – has resulted in something uniquely creative, something amorphous, and almost impossible to describe. At times it borders grime, at others it echoes the breakbeat movement, while continually pursuing its own path, aware of its heritage while never consciously looking back. Put simply: you know it when you hear it. And a lot of people are listening. 2017 has been a banner year for jazz in this country, gaining international plaudits and breaking down barriers placed around the music. Our record bag is bulging at the seams with vital releases by some incredible musicians – here’s a taster of what’s been on the stereo over the past few months. Moses Boyd has absolutely bossed 2017. A collaborative album with Binker Golding saw the pair’s near-telepathic interplay take them all the way to the Later… with Jools Holland studio, while he’s worked on a stunning array of material as a collaborator. It’s this Vinyl Factory release with Moses Boyd Exodus that catches our eye, though; ‘Absolute Zero’ veers between polyrhythmic blurs to Madlib hip-hop abstraction, while retaining that uniquely UK, uniquely London slant. Zara McFarlane is part of a clutch of UK jazz musicians gravitating towards Brownswood, the label run by Gilles Peterson and a team of aural experts. New album ‘Arise’ features a who’s-who of London jazz, but it’s Zara’s own voice that stands out most clearly. Whether it’s a deep, soulful cover of ‘Fisherman’ by The Congos or her own confessional work, ‘Arise’ never loses sight of its own solitary, inspirational quest. YAM Records in Peckham is more than just a record shop – it’s a meeting place, a hub, a breeding ground for new ideas. Now operating its own label arm, Joe Armon-Jones and Maxwell Owen crossed paths recently for the mighty ‘Idiom’. A record so soaked in South East London that it may as well be a regular at New Cross’ chicken hotspot Smokey Jerkey, the sheer weight of those grooves came across most succinctly during a recent titanic blowing session for Boiler Room. Nubya Garcia is simply one of the most talented, most dexterous musicians in the country right now. A member of the all-female Nerija collective – whose own work is well worth seeking out – the past 12 months has seen this London saxophonist excel as a band leader and collaborator. Nubya’s 5ive project through Jazz Refresher saw her fuse gospel and Caribbean leanings with jazz tradition, expertly re-tooling it to suit her own aesthetic needs. The sweetness of her own voice is not to be under-estimated, too – a wonderful improviser, her commitment to tone and melody means that it often feels as though she’s singing through her instrument. A.R.E. Project unites three figures who could easily dominate this article in their own right: Hieroglyphic Being, Sarathy Korwar, and Shabaka Hutchings. An improvisational four piece set, this 12 inch on Technicolour lurches from murky electronics to Eastern drones, all held together by a thirst for the new. Between the eclectic effects and Shabaka Hutchings' inquisitive saxophone lines, this is a vast, lugubrious affair, one to become completely immersed in. When they first emerged Blue Lab Beats were often pinned down as part of hip-hop’s more left leaning impulses, but the truth is this London duo are much more difficult to analyse. Sure, hip-hop is in there, but they’ve also mixed tracks for Dua Lipa and Rag’n’Bone Man while developing their own, distinctive, improvisational take on what could loosely be termed jazz. Beat-driven, the pair’s stunning live sets include a January date in London’s Jazz Café re-tooling Guru’s Jazzanova songbook, while their own ‘Xover’ album is on pre-order now – typically broad, it features Dylan Jones and (of course) Nubya Garcia. South London’s Wu-Lu is almost better known as a DJ right now, a selector and curator of sounds. All that is set to change, though, with this dexterous Brixton musician planning a slew of releases over the next few months. Regular readers might well be familiar with latest cut ‘Jaybo’ – it’s a previous Track Of The Day – and it acts as a mission statement of sorts: murky fare, it’s bass abstraction is fused to psychedelic guitar lines and a tender sense of soul. The demise of Yussef Kamaal robbed British music of one its most profound voices, with the group’s debut – and, we suppose, only – record becoming an instant classic in this vortex of fresh jazz innovation. Yussef Dayes now has a new group, and took to the stage at East London’s vital showcase event Church Of Sound recently. A heavyweight play through the Jimi Hendrix songbook, it was the second, rather more cathartic set that caught our ear – dark and intense, it felt as though the drummer was channelling some heavy, almost grotesque, emotions, while still retaining that incessant thirst for something new. Whatever happens next, it will be gripping. Born out of a desire to something without borders, Vels Trio have pretty much stuck to that mission statement ever since. London-based, they recently took their version of Madlib’s ‘Shades Of Blue’ – famously constructed from the Blue Note archive – to Paris, a sign of the respect musicians in this country have earned internationally. We’ve picked their EP ‘Yellow Ochre’, though, for a few clear reasons: it’s a solid jam, it features totemic saxophonist Shabaka Hutchings, and it was released on the label wing of Dalston night-spot Total Refreshment Centre, one of the real champions of jazz innovation in London. Tenderlonious heads up 22a, a label so on-point we could pretty much fill this column entirely with artists from its roster. A saxophonist, flautist, producer, and DJ, the sheer force of this musician's personality is forging out a fresh universe for others to explore - as well as heading up the multi-faceted 22archestra, he also jumps into expansive, and often extremely personal territory with Ruby Rushton. 'Trudi's Songbook Volume 1' soundtracked our summer, and the second instalment will see us through winter. One of the hallmarks of the current generation of jazz musicians is collective action, the belief that new communities can be built through the exchange of fresh ideas. Ezra Collective have this stamped in their name, and it’s certainly evident in the music. New EP ‘Juan Pablo: The Philosopher’ is a real fusion sound, touching on everything from Afrobeat to grime and bop, embracing possibility at every turn. Perhaps that’s why they’ve opted to cover Sun Ra’s mighty ‘Space Is The Place’ – it’s an intergalactic journey, one that isn’t about to stop any time soon.